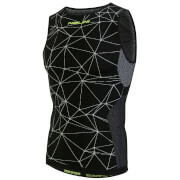 Extremely lightweight short sleeve baselayer is made from a breathable material that expels moisture and keep you dry. Extremely light and breathable material Dryarn. Anatomic shape for great fit.